On a strict diet and looking for a new healthy yet tasty recipe to try? I have just the one! 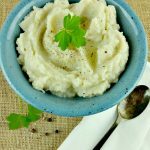 It is a recipe for Paleo Instant Pot Mashed Cauliflower! This recipe works with just about any diet restrictions such as Paleo, Whole 30, Dairy Free, Vegan, Sugar-Free, Low Fat, Low Carb and so on. Let me just say that even with this being a super healthy recipe that works with diets, it tastes AMAZING! You would never know that this recipe did not have cream or butter in it unless told. It turns out that tasty and creamy! It even makes for a great way to get some veggies into those picky eating kiddos without them knowing. With this recipe, I make it super fast in the Instant Pot, but you could make it on the stove top as well. You will need an immersion blender or potato masher. A food processor or hand mixer would also work I guess. Oh, you will also need a colander for straining. You can also change this up slightly to fit your tastes. Such as adding some extra herbs like chives. If you are not a garlic fan, you can leave it out and it still tastes great. If you like this Instant Pot recipe, here are a few others to try. This is a MUST try recipe for anyone eating low carb, low fat or doing the Paleo and Whole 30 diets. Add water, garlic and cauliflower to the inner pot of the Instant Pot. Place lid on Instant Pot and lock in place. Make sure the valve is closed. Push the steam button and add time until you have a cook time of 5 minutes. After it beeps that it is finished, do a quick release by opening the valve to vent. After it is finished releasing the pressure, dump the inner pot into a colander to drain off the water. Then return the cauliflower back to the pot. 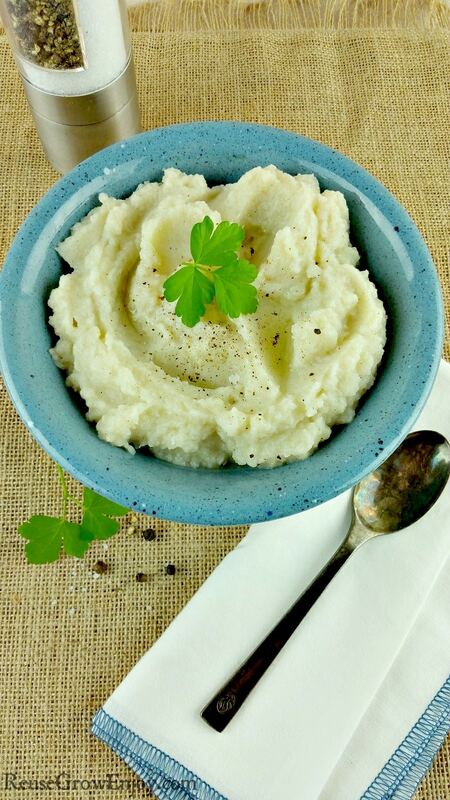 Using a potato masher or and hand blender mash up the cauliflower until smooth. Add pepper and Avocado Oil in and mix again with hand blender.